NETWORK UPDATE: HAWAII 5-0 gained 0.1 in final numbers, as did WHOSE LINE IS IT ANYWAY. 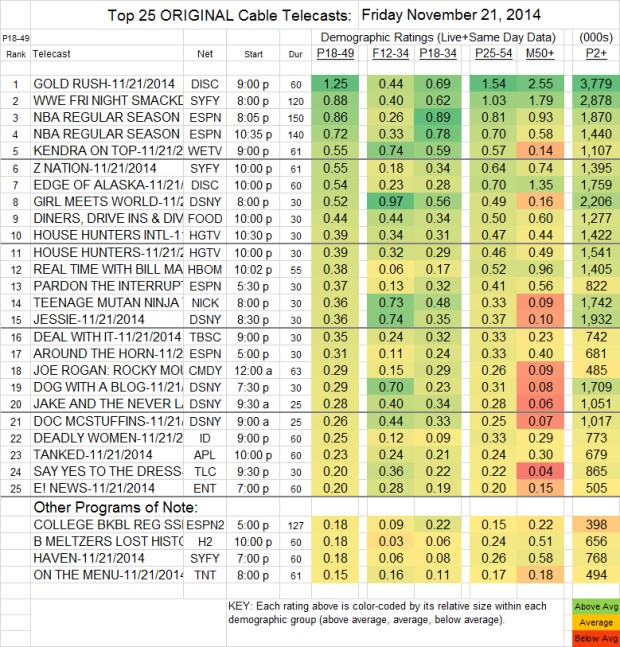 Discovery’s GOLD RUSH was again #1 on Friday cable, although it fell by 0.24 from last week to 1.25. Lead-out EDGE OF ALASKA was likewise down 0.22 to 0.54. 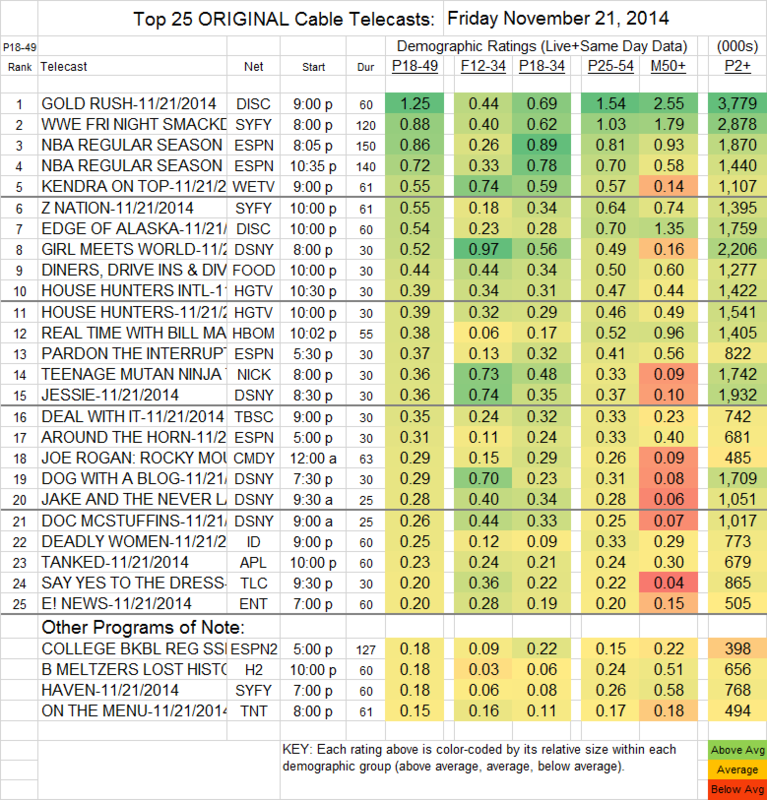 Syfy night’s was led as usual by WWE, up 0.11 to 0.88. Lead-in HAVEN fell 0.04 to 0.18, and at 10PM Z NATION was up 0.03 to 0.55. KENDRA ON TOP (We) gained 0.06 to 0.55. ESPN’s NBA doubleheader wsa at 0.86/0.72, up from last week’s 0.55. DEAL WITH IT (TBS) lost 0.09 to 0.35. On HBO, REAL TIME WITH BILL MAHER was up 0.06 to 0.38, but FOO FIGHTERS: SONIC HIGHWAYS lost 0.08 to 0.14. TNT’s ON THE MENU increased by 0.02 to 0.15. On IFC, COMEDY BANG BANG zoomed (comparatively) from last week’s 0.01 to 0.08, with 148K total viewers, while BIRTHDAY BOYS rose from 0.01 to 0.04, with 102K total viewers.